‘My Immigration Department will send her to Australia. 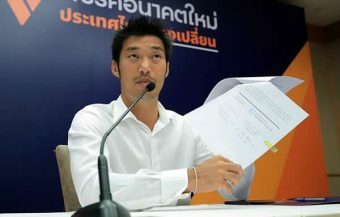 She leaves tonight.’ – Immigration chief Surachate Hapkarn confirmed earlier. Lucky Australian woman deported from Thailand after her visa overstay of 111 days. She could have faced time in a Thai prison and prosecution if she had stayed in Thailand any longer and had been detected by Thai Immigration police. 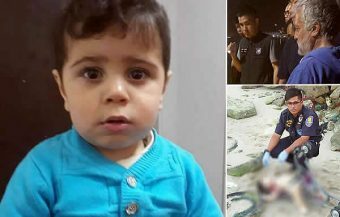 She was instead held at a Bangkok Airport Immigration detention centre following her arrest, as she tried to board a flight home on January 8th. A 46 year old Australian woman, named as Claire Amelia Johnson, residing in Gold Coast, a metropolitan region south of Brisbane on Australia’s east coast, was deported from Thailand on charges of overstaying for visa in Thailand by 111 days without official permission. She flew out on a Qantas Airways flight bound for Sydney on Thursday. 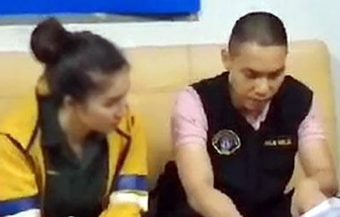 The woman was detained by Thai authorities, over 1 week ago, as she attempted to board a flight home on January 8th 2019. Claire Johnson appears to have run a cosmetic package firm in Thailand engaged in medical tourism. Such business are highly regulated in Thailand and strictly restricted to Thai nationals. It appears that she voluntary deregistered a similar firm in Australia some time ago. The Australian woman’s social media profile features beautiful photographs which look like they were taken in Thailand. The woman obtained a replacement passport from Australian authorities late last year. However when she attempted to board her flight to Australia on January 8th last, she was detained by Thai immigration police after they discovered that she had overstayed her visa by more than 90 days. 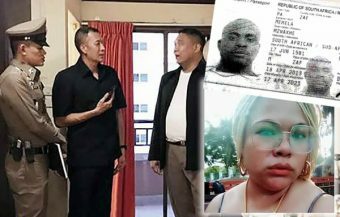 Thai law provides for a maximum fine of ฿20,000 to be paid up to this point but thereafter the offender faces prosecution, time in a Thai prison, a fine and being blacklisted from Thailand for 1 year if the overstay is less tan 1 year and the offender has not committed any criminal transgressions. After being held for over a week the Australian’s deportation was confirmed this week by the Head of Thai Immigration, Surachate Hapkarn. She was flown home on a Quantas Airways flight from Bangkok to Sydney on Thursday evening. Official sources in Bangkok have let it be known that the Australian woman had breached Thailand’s immigration laws and overstayed her visa by a whopping 111 days. Even after all that, the business woman was treated leniently by Thai immigration police and held at a detention centre at the airport. Many other foreigners, although perhaps involved in criminal transgressions or longer overstays, have been committed to Thailand’s prison system for similar breaches. It is reported that the woman was held at an immigration detention centre at Bangkok’s Suvarnabhumi Airport after she was not allowed board a flight on January 8th. That is when immigration officials discovered that she had seriously overstayed her visa in Thailand. It has perhaps fortunate that the woman, when she was detained, had not extended her stay very far beyond 90 days as this is a critical cut off point for Thai authorities in determining how they treat visa over stayers. Ms Johnson’s messages, after her detention, were quite hyper, to say the least, and showed that she was clearly disturbed by the turn of events. Being arrested in Thailand can be a shocking experience for any western person. At one point, she compared her life to a TV hit show series, suggesting that fate had written a dramatic alteration in ‘season 5’ of her life. She observed that all life’s adventures ended with a ‘big bang’ as she introduced her situation online. She made dramatic calls on her friends, through social media, to come to her assistance. She asked them to contact the media and the Australian embassy without delay. The messages were sent as she was being led off to the detention centre. She did mention, however, that Thai immigration officers had assured her that being held at an airport detention centre was nothing like being committed to Thai prison. They did not lie as many other, less fortunate, westerners can attest to. Even so, Ms Johnson found it very trying. ‘They are taking my phone, have to go,’ she told her social media friends as he was led away. ‘They said the detention centre is not like a jail. I am praying he is right,’ she said. 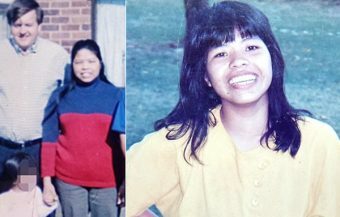 Her friends told the media that the Australian woman had informed them that she needed money for a blanket and a pillow in her confinement as none was provided in the spartan communal cell with hard bunks, a luxurious situation compared with Thai prison accommodation. ‘She said something about wanting to buy a blanket in the jail, you must have to buy a pillow and a blanket,’ one reported. ‘Now I know what it feels like to be a prisoner. They won’t even let me go to the toilet by myself,’ the Australian women was later reported as telling her friends. At the the time of her arrest at Suvarnabhumi Airport, Colonel Thatchapong Sarawanangkul, the Royal Immigration police chief who was in charge of her case, said that Ms Johnson had been detained, rather than simply fined, because the period she had overstayed her visa had exceeded 90 days. According to Thai law, tourists who overstay in Thailand, will have to pay a daily fine of ฿500 for very extra day beyond the visa expiry date, before they are allowed to leave the country. 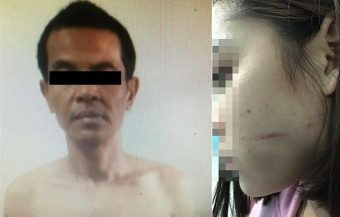 After sending several text messages to a friend of hers, Juliet Potter, seeking help and pointing out that she was being detained and her phone would be confiscated, she eventually drew the attention of the western media who are always interested in stories of western foreigners, particularly a beautiful woman, who end up on he wrong side of the law in Thailand. It then emerged that Ms Johnson had, in fact, illegally stayed in Thailand for 110 days beyond her visa limit. Her friend, Ms Potter, told the Daily Mail Online from Australia that her friend needed help, ‘She apparently has to pay somebody,’ she said. ‘She said something about wanting to buy a blanket in the jail; you must have to buy a pillow and a blanket, she added. Thai police confirmed on Thursday, that the Australian woman had departed Bangkok on an Australian Qantas Airways flight which was supposed to arrive in Sydney on Friday. ‘Although most tourists who don’t abide by visa rules in Thailand are just hit with a fine, it is believed Ms Johnson’s deportation was due to the length of her overstay,’ police said. She was supposed to go back to Australia more than a week ago, but on Monday evening, she sent a message to Ms Potter urging her that she was in an immigration detention center in Bangkok and begged her to help her. The Department of Foreign Affairs and Trade would only say that it was only providing consular assistance to an Australian woman, named Claire Amelia Johnson, detained in Thailand, in accordance with the consular services charter. In November, Ms Johnson posted on Instagram a picture of an emergency passport she had obtained through the Australian embassy in Thailand. These are issued after an original passport is lost when an Australian citizen is overseas. However Thai immigration maintains its own database of foreigners who enter and leave the country and in the last two years has robustly tightened up the regime. Records are kept of all foreigners entering and leaving the kingdom. There is now a zero policy towards foreigners overstaying their visas in Thailand and Ms Johnson is very fortunate that her overstay did not go much further beyond 90 days when she was apprehended on January 8th. Ms Johnson is reported to have been running a medical tourism business called Cosmetic Holidays International that provided cosmetic packages in Phuket, one of Thailand’s most popular urban centres for western foreigners and most especially Australians, on the Andaman Sea. It has some of Thailand’s most popular beaches, mostly situated along the clear waters of the western shore. It is not clear whether the Australian woman had a work visa or the relevant licences to operate such a business in Thailand. The medical industry in Thailand is highly regulated as authorities seek to bolster confidence in what is becoming a major industry for Thailand drawing tens of thousands of visitors and patients each year. Thailand also has very strict work permit requirements for any foreigner working in the country. The medical industry in Thailand is tightly restricted to Thai nationals or juristic persons only. Even then, there are regulations involving Thai staff levels and medical licences if any foreigner is involved. It is strictly illegal and indeed an offence in itself, for tourists in Thailand to engage in work affairs or commerce that is based in Thailand without a work permit or valid licences. According to investigations, the Australian woman’s business was deregistered by the Australian Securities Commission in May 2017; however, her social media accounts continued to operate and promote for her cosmetic surgery tourism operations. She described herself on social media as the founder of Cosmetic Holidays International, ‘a medical tourism agency that offers cosmetic packages in Phuket,’ she said. 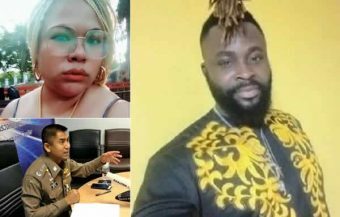 Surachate Hakparn, Thailand’s immigration chief, told Australia’s Fairfax Media that Ms Johnson had been arrested and fined and so would be deported. Her tourist visa overstay was confirmed to be more than 100 days. 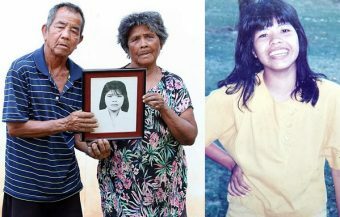 However, there was limited media coverage of Claire’s case in the Thai media. Where there was, it is the same as many other such stories. Some Facebook messages on the matter, from people who have knowledge and experience of the issue, suggested that Claire may have overstayed her visa for an extended period. This turned out to be true. Normally, under Thai law, tourists who overstay their visas in Thailand will pay a small fine before being allowed to leave the country. The critical point is that any overstay must be less than 90 days. Tourists can easily pay the fine as the immigration checkpoint and then leave the country; such an occurrence will not cause any issues for visitors returning to Thailand in the future. Such an overstay fine does not involved Thailand’s blacklist system unveiled in 2016. However, visitors can still be be arrested if they fail to pay the fine on the spot. 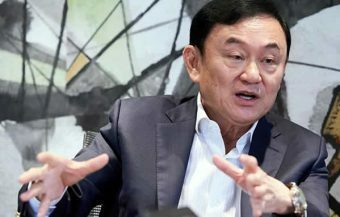 Thailand’s new immigration crackdown, led by the new Immigration boss Major General Surachate Hapkarn, has established an altogether new state of affairs in the country where long stay visa overstays are simply no longer tolerated and all but eliminated. There are regular overnight sweeps with reports suggesting the arrest of hundreds of foreigners found ignoring the law at a time. The new limit for visa over stayers in Thailand is zero. Thailand, like many other countries, holds any refugees seeking in asylum in detention. 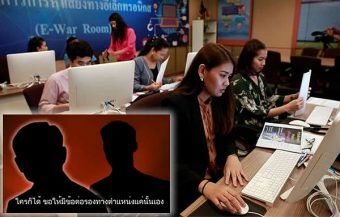 The policy is popular with Thai people and many report illegal foreign nationals staying in apartments, houses or condominiums. 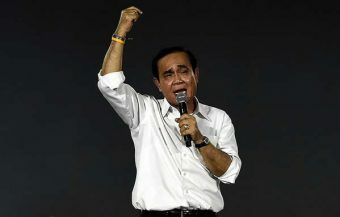 Thailand’s leadership, at the highest level, views this approach as essential for Thailand’s internal security. Moves are underway to deploy the most sophisticated technology, including iris scans, to record all people entering and leaving the kingdom. 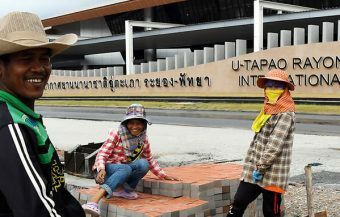 An earlier Thai Immigration boss coined the term: ‘Good guys in, bad guys out,’ to mean that while Thailand immigration officials seek to welcome visitors to Thailand and ensure their safety and convenience, they also want to root out people who think they can abuse Thai visa laws. 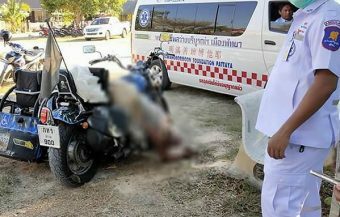 It has been shown that such individuals are usually infringing Thailand’s laws in other ways also. The policy is working. It appears Ms Johnson as very fortunate to have left Thailand when she did. 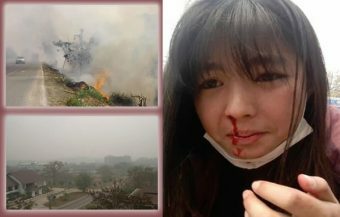 It has not yet been confirmed whether she is blacklisted or not for up to 1 year. A visa overstay is when someone settles in Thailand for a period that exceeds the period of time they are permitted to be in the country or stays beyond the visa expiry date. However, the Thai Immigration officials realize that sometimes visitors plans can change. For instance, with a few hours overstay, the overstay fine is often annulled as the overstay tourists are exempted from paying it. 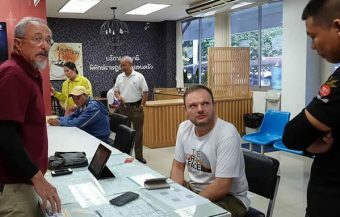 In other situations, visitors can attend a Thai immigration office and they will be offered advice. Thailand’s immigration authorities have recently urged ‘good’ foreigners or visitors to avail of this service. However, if it is matter of days, the over stayer must pay a fine of ฿500 per day. Failure to pay this fee will result in the traveler being detained, missing their flight and perhaps ending up in more serious difficulty as the clock keeps ticking. The maximum fine however is ฿20,000 but it must be paid. There are some western foreigners who have been jailed in Thailand or even had prison sentences for immigration offences extended because they could not pay this sum of money which is the equivalent of $620. This happened to a UK national who was injured on his way to the airport in a car accident. 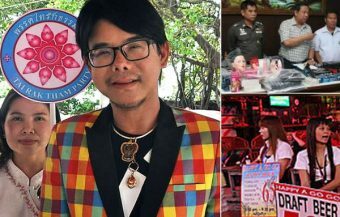 He ended up in a Thai hospital for an extended stay and was later detained on his second attempt to leave the country by Thai immigration police for overstaying and not being able to pay the fine. The threat of this was brought home to a group of travelers from Cork in Ireland in 2015 when they ran out out of funds and could not pay a visa overstay fine. 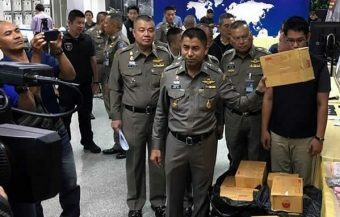 They had to frantically arrange to have money sent to a regional airport in Thailand as they were about to be taken into detention and miss their connecting flight in Bangkok. Matters may get very serious if the period is 90 days or over. In this situation, not only does a charge of ฿20,000 apply but also the traveler is placed on blacklist and may face criminal charges. Many western foreigners, in this situation, who cannot afford to pay the fines and facing prosecution are transferred to a Thai prison. 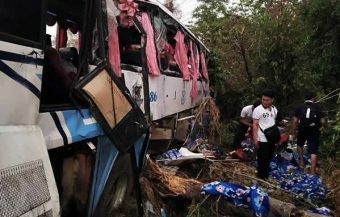 This is not a pleasant experience and can lead to further complications, all the while leaving the traveler blacklisted from Thailand for at least 1 year and longer depending on the overstay period.